In a couple of previous article we read about how ones present life was affected due to the acts of one’s past life, w.r.t. Dhritarashtra and Gandhari from the epic Mahabharata. Our epics are full of examples of Karmic destiny, especially Mahabharata. Nearly all characters have been subject to this, including Lord Krishna. However, Karna was one character in Mahabharata whose tragedy had nothing to do with his past life (or so it seems as nothing has been found in any texts). His tragedy is due to his being good, yes; all that goes wrong with him is because he wanted to be of help to someone. Let’s see how. 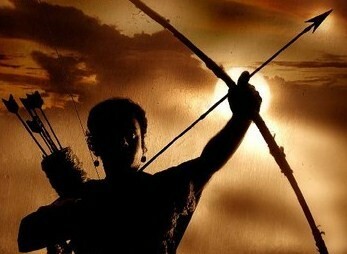 It is said that Karna was training under the great ascetic-warrior, Parashuram (who was also an avatar of Lord Vishnu). Karna had told him the truth that he was raised by a charioteer and did not know his caste. Once, Parashuram went off to sleep with his head on Karna’s lap. A blood-sucking insect bit Karna on his thigh. It pained Karna, but he did not move, lest it woke up his Guru. When Parashuram came to know about it, he was shocked that someone could bear so much pain in spite of all the blood that had been lost. According to him, only a Kshatriya could have it in him to bear such pain and Parshuram hated Kshatriyas. This enraged Parashuram so much that he cursed him that, all that he had learnt from him would go in vain, as he would never be able to use it, especially when he needed the most. Isn’t this tragic? Karna was honest enough to say what he did as he had no clue about his parentage and by not moving after the insect bite, he was only allowing his Guru a peaceful nap. Was this fair? Another legend says that long ago, Karna saw a young girl crying as she had spilt milk on the ground. To stop her from crying, Karna is supposed to have taken soil from the ground where milk was spilt and squeezed out the milk so that the child could have it. This angered Bhoo-devi (Earth-deity) and she is supposed to have cursed Karna that it would be the same soil that would one day, hold him to his death, as he had squeezed out milk from her soil. 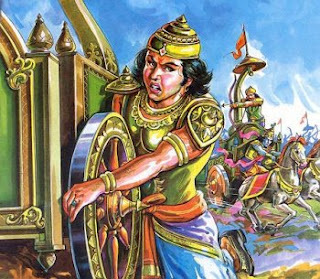 During the war of Kurukshetra in Mahabharata, at a very strategic point, the wheel of Karna’s chariot was stuck in the soil and no efforts would get it out of the soil. He got down the chariot to do so physically, as he had forgotten the magic formula taught to him by Parashuram to release a wheel if stuck on the ground, is when he gets hit by Arjuna. His end was brought by the act of kindness that he had shown to his guru and the crying girl. This make one feel that Karna’s tragedy had nothing to do with his karma, but was some sort of a conspiracy to make sure that he suffers. The following story also lends credence to the same theory. Karna’s charioteer was Shalya, the King of Madra. Shalya was the maternal uncle of the younger Pandavas, i.e. Nakula and Sahadeva. When Kings and regions were aligning themselves for the great war of Kurukshetra, Shalya left for the battlefield. On his way, he was pleased to see that arrangements were made for his army and was impressed at the thoughtfulness of the Pandavas. Later he learnt that he had been duped into accepting the hospitality, from the Kauravas, due to which he had to fight on behalf of the Kauravas. To humiliate him further, Duryodhan asked Shalya to be the charioteer of Karna, the arch-enemy of the Pandavas. On Krishna’s advice, Shalya would continuously praise Arjuna during the battle, to de-motivate and distract Karna. Also, when anything goes wrong with a chariot, it is the responsibility of the charioteer to alight from the chariot and repair it. When Karna’s chariot got stuck on the ground, Karna is supposed to have asked Shalya to do so, but Shalya refused to alight as he was a King and it was below his dignity to such things, besides the fact that he did not know how to get the wheel out of the ground. It was only when Shalya refused to do anything, did Karna have to alight, disarming himself, which made him vulnerable to Arjuna’s attack. All this lends credence to the theory of conspiracy. Where is karmic destiny here? Karna had been wronged from the time he was born to an unwed mother, Kunti. All through the epic he had been insulted about his lack of knowledge of his parentage, when two of the most important characters of the epic, Kunti and Krishna were actually aware of it but had opted to keep quiet. He is apprised of the truth at a wrong moment in the epic and that too as an effort to buy his support. At the end, he dies a heroic death. It is said that the day he was killed, the war came to an early end for that day, as all the charioteers from both the sides mourned his death, as he was raised by a charioteer. Could the author of the epic have decided to create a tragic character and thus such characterisation? Or was it the ideal example of a good guy on the wrong side? Whatever, be the case, Karna’s tragedy had nothing to do with his karma. An interesting question and often asked by many. How can someone have 100 sons together or even one after another? Could it be that she had many combinations of twins, triplets, quadruplets, etc. many times over? Mythology is replete with instances which are known as supra-normal births (beyond the range of normal or scientifically explainable), where births have taken place from fire, any body fluids, like tears and sweat, or from body parts like thigh, etc. This is essentially done, to connote a sense of ‘difference’ on the said character and also to hint that the character is destined to do in-human acts or feats. This was the then author’s way of assigning an importance to the character in reference. We will not get into such instances as all heroes in mythology have had ‘different’ births, like Krishna, Jesus, Hercules, Rama, Ganapati, to name just a few. Mahabharat is full of supra-normal births, be it Dronacharya, Kripacharya, Draupadi and her brother, and of course, Gandhari’s hundred sons. The birth of Gandhari’s hundred sons, in brief – After Gandhari had conceived it was close to two years and she had not delivered. When she heard the news of Kunti’s children being born in the jungles, she was frustrated and angry and in her state of rage, she started beating her stomach. Soon she delivered a mass of flesh. Vyas had once blessed her with a hundred sons (a common blessing in those days) and when she saw the mass of flesh, he was called. He immediately instructed her to assemble a hundred jars with ghee (oil) in it. Gandhari at this stage expressed her desire to have a daughter too. As soon as the jars were assembled, Vyas divided the ball of flesh into a hundred and one parts and distributed each into the jars. He asked her to cover them and leave them, and soon she was the mother of hundred sons and one daughter. Another theory says that there weren’t a hundred sons, but just two, i.e. Duryodhan and Dushsshan. This gains ground as in the entire epic; these were the only two whose names had cropped up time and again (though later, we have heard of Vikarna, the Kaurava who was against the war). Also, the pregnancy lasting for two years lends credence to this theory. People of antiquity had never quite been able to explain the concept of twins (You can read more about twins in mythology in my earlier series "Twins – A case of peaceful co-existence. " dated May 1, 2011). The two-year pregnancy could have been put in to explain the birth of twins. Another version is that the evil of Duryodhan was equal to that of hundred people; a concept similar to that of Ravana’s ten heads which implied his immense intelligence and knowledge. Mythology, like fiction also thrives on hyperbole and on a more simplistic note, this could be just that. Another version takes the help of etymology (the study of the origin of words). Duryodhan means one who is difficult to fight, (‘duh’ – difficult & ‘yodh’ – to fight) representing ego & Dushasana means difficult to control. Representing ‘huge ego’ and ‘lack of control’ as a hundred only gave a sense of proportion to the immense trouble that the duo could unleash. 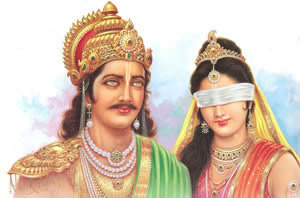 A philosophic explanation is as follows – Dhritarashtra represented blind mind and Gandhari represented blind intellect following the blind mind. Together they breed unfulfilled desires, dreams and ambitions, all unleashed on what stood for reason and law (dharma). The result of such a clash could only be a war of epic proportions! The sheer beauty of what the authors of antiquity wrote is brought out by such representations, which to a rationalist mind might seem ridiculous and jest-worthy! Modern thinking should be used to understand the deeper meanings in the myths and not to look down and make fun of what was written way back, when ‘science’ was not a subject. I guess this is what education is all about! I hope I have been able to answer my readers query!! 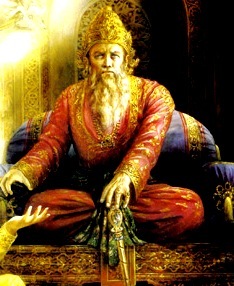 In a previous article - Dhritarashtra of Modern Times (dated June 12, 2012), we read about the karmic destiny of Dhritarashtra. How it was destiny that made him blind and made him endure the death of a hundred sons. Mahabharata has numerous such examples which give similar reasons for ones suffering in the present life. From Dhritarashtra, let’s move on to Gandhari. Why was she destined to live a life of blindness, when she was not naturally blind and why did she have to endure such tragedy? Gandhari was the daughter of Gandhar, the modern day Kandahar, in Afghanistan. She tied a cloth on her eyes when she came to know that her would-be husband was born blind and vowed never to see what he couldn’t. Many say that she made a mistake and if she had not done this, she would have been a great help to her blind husband, and the course of Mahabharata would have been different. Gandhari’s logic however, was that she did not want to seem superior in any way from her husband and make him feel small, and this act of hers had made her his equal. Some even say that she did this as a silent protest to the high-handed behaviour of Bhishma, who despite Dhirtarashtra’s disability had nearly forced the King of Gandhar to agree to the alliance. In the modern world, her act could be questioned, but in Mhabharata, she was hailed as an ideal woman. 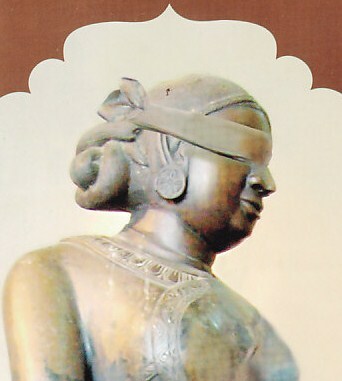 Her blindfold is supposed to have given her an inner view to the world around her and though she missed a lot, she never lost ‘sight’ of the fact that the Pandavas were not treated justly. On many occasions she is known to have advised her husband and chastised her son Duryodhan. At the end of the war of Kurukshetra, she is supposed to have asked Lord Krishna, whom she blamed for the war and the death of her hundred sons, especially Duryodhan, as to what had been the reason for such a tragic life. According to Lord Krishna, long back, while cooking rice, she had poured hot water of the boiled rice on the ground outside her kitchen. This hot water killed all the hundred eggs laid by an insect. This act of hers had earned the wrath of the mother insect who is supposed to have cursed her that she too would have to endure the deaths of her sons, as she had. (In many villages women are advised not to pour hot water from the rice on the ground; they should pour it after it has cooled down or mix cold water before draining it off!). According another local rendition of Mahabharata from the East, she was cursed by the mother turtle whose eggs, Gandhari had once crushed one by one. The above is a classic case of karmic destiny which has been illustrated time and again through various characters of Mahabharata. Rather, it seems to be an underlying theme of Mahabharata. This might have been done by the authors of the times to ensure that one takes care of one’s actions in the present life. Even if this is done out of a fear for the results in the next life, one will ensure that he or she does little or no harm. How would one react to ones shortcomings in this life? Well, one school of thought would feel that if the karmic theory is to be subscribed to, then people would stop making efforts to change the hardship and simply live with it. Contrary to this, one can say that one would accept it as destiny and not be unnecessarily self-critical. Accept and move on to face the new challenges that have been in store! I guess this theory of Karmic destiny is a case of glass half full! There are a number of such characters in Mahabharata, who were what they were, due to the theory of karma. All but one, who was a tragic character for no theory of karma. We will discuss this character next time! Keep reading…. Yesterday, we read about the legends and myths associated with the Lord Jagannath, Lord of the universe, and the chariot procession. 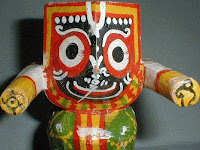 Today we will read about its origin and the cult of the Jagannath worship. The legend of King Indradyumna is taken from the Skanda Purana, besides the same being referred in many other Puranas like Padma Purana, Brahma Purana and Narada Purana amongst some of them. We are also told that Lord Jagannath is mentioned in the Vedas and King Indrayumna was some Vedic figure. The Rig Veda has some hymns which refer to the floating of a wooden log from which was carved out the idol of Jagannath. What is interesting is the idols of the triad. Usually the idols of all gods in the Hindu pantheon are well defined and perfectly carved or painted. But the idols at Jagannath temple are not so. It is not shapely and is like a wooden stump with large round eyes, painted in dark garish colours and the lack of body. However, all this has been associated with the story of the unfinished idols. But at the end of the day, it has looks which defy its association with the prevailing Hindu gods and goddesses. 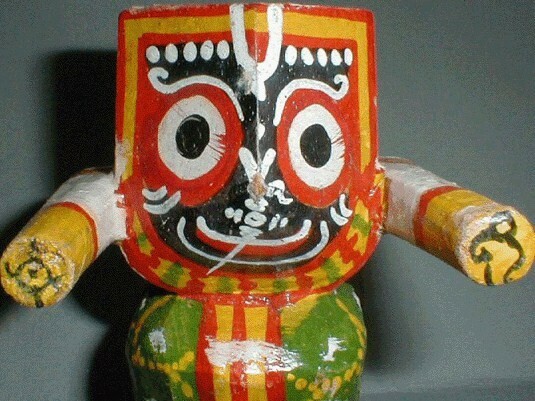 Many scholars have opined that the worship of Jagannath has tribal origins. In the myths discussed yesterday, there has been mention of a Savara tribe, who were considered to be the earliest inhabitants of the Odisha. The Savaras were a tree worshiping tribe, which was a very common mode of worship (tree or stumps which resemble a tree-like structure), for many tribes in the world. The Savaras used to worship trees, and singing and dancing in front of their god, Jaganata, was part of the rituals. The scholars feel that with the migration of the Aryan communities in such areas, the ritual harmonised into a common festival and the tribal Jaganata soon metamorphosed into the aryanised Jagannath, with Vedic and Puranic attachments. Another very interesting aspect of this is the sudden emergence of a triad from the single god. All myths begin with a single god, be it Nilamadhava or Jaganata. But somewhere the single god transforms into a triad. One of the versions given by scholars was that in the earlier days the Lord Jagannath was seen with his consort, Lakshmi. Somewhere, to appease a section of the Shaivas, Balabhadra or Balarama was added to the couple, but this posed another problem. 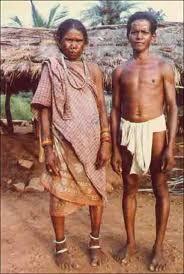 According to the Oriya convention, the elder brother could not see the face of the younger brother’s wife. This convention made the consort make way for the sister, Subhadra in this case! Such things happen to accommodate more deities or could even be an act of appeasement of other communities or tribes in the widely followed cult. According to some British scholars, the association of the colour blue, Nila, in the myths of Nilamadhava and Nilanchal, could be ascribed to the common use of the easily available blue coloured stones which were usually used for making idols during the ancient times. In the earlier days, the gods were offered raw and uncooked food. With the slow aryanisation, the rituals of worship has become more Brahminical and cooked food is offered to the deities today. But a close scrutiny of the rituals will reveal that a lot of practices of tribal origin still prevail. It is pertinent to mention here that the worship of the original Nila Madhava is prevalent in the hill-top region of Brahmachala, on the banks of the River Mahanadi at Kantilo, in Nayagarh district of Odisha even today! Finally, the worship of Jagannath is performed by a tribal community who are the hereditary servitors of the Lord. They also observe the funeral rites of the Lord during the Nava Kalevar and also own all responsibility of the yatra. What is further interesting is that these priests are non-Brahmin, which goes on to show that though the Aryans went on to own the deity, the tribal community continued to own the rights to serve the deity. The Jagannath worship is a classic example of synthesis of two different cultures and background and a harmonised association of both coexisting in modern times. A perfect coexistence of Vaishnavite and Tribal cults. This could be one rare instance of a tribal deity being given such prominence in the Hindu pantheon, even though its prominence has Vedic and Puranic leanings. Today is the famous Ratha-yatra festival in India which is celebrated with much fanfare in Puri, Odisha and other Eastern parts of India. Lately, the festival is celebrated in many other parts, under the aegis of ISKCON group. Last month, I had written a few articles on the similarities of our Ratha-yatra with similar yatras in Nepal and Egypt (http://www.utkarshspeak.blogspot.in/2012/05/ratha-yatra-in-india-and-abroad-part-2.html ). 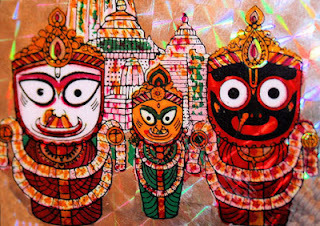 But today we will focus on myths and legends of the Puri Ratha-yatra. According to the most prominent legend from Skanda Purana, after the war of Mahabharata, King Indradyumna was very intrigued when a travelling pilgrim told him about the practice of worshipping of Nila Madhava (Blue Vishnu) in the region of Nilanchal (Blue Mountains) in the present day Odisha. The next day, Vidyapati, the kings brother set out for the region to have a look at the deity. The Savara king of the region, received Vidyapati and assured him to take him to see the deity the next day, but under the condition that he would be blindfolded to and from the temple. Vidyapati agreed, but took some mustard seeds in his pocket, in which he had made a small hole. The entire route to the temple was strewn with mustard seeds so that the route would be marked with mustard flowers for him to seek out the way next time he wanted to go. Later Vidyapati returned to his region and told the whole story to King Indradyumna, who then set out to see the deity by himself. On reaching the spot, they were surprised to see that the deity was missing and the whole area was covered with sands from the nearby shore. The King came back dejected. Later he was told by Narada Muni to perform Ashwamedha Yagna to appease Nilamadhava. On the completion of the yagna, they heard a divine voice tell them that his prayers have been answered and that they would find a log floating on the waters soon, which would have divine marks like a conch-shell, etc. The king should carve out images of three gods and install and worship the same. Soon after they found a log of wood floating with such marks and the log was of neem tree. Around the same time an old Brahmin came from nowhere and suggested that he could do the work best as he understood the divine marks, but with a condition that he would do it behind closed doors and would not come out of the room till the idols were ready and nobody should come in before it was ready. Soon the carving started and everybody grew curious day by day, just as were the King and his Queen. One day they heard no sound coming from behind the doors and the Queen was sure that the old Brahmin was dead. She ordered the doors to be opened. As soon as the door was opened, the old Brahmin vanished from there and there were only the unfinished idols. Since that day, the unfinished idols have been worshipped in the same form. Many say that the old Brahmin was none other than the divine architect, Lord Vishwakarma, himself. The idols are made of wood, so the idols have to be replaced once in a while. The idols are replaced in the years when there are two Ashad (June/July) months, as per the Hindu calendar, which comes once in 24 years in a well marked event known as the Nav Kalevar. The belief is that in such a year the earth and the universe undergoes some change in its shape and form, and thus the Lord of the universe, Jagannath too receives the same change. The old idols are buried in the temple premises. The present idols were last replaced in the year 1996. The new idols continue to be made, coloured, carved, etc. in the same manner as the original. The temple is the house for Lord Krishna, as Jagannath, his brother Balabhadra or Balarama and their sister Subhadra. 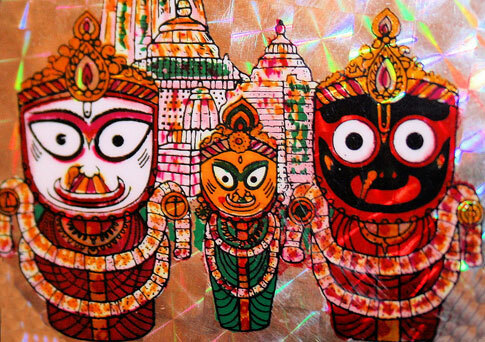 According to a legend, Lord Jagannath had once expressed his desire to spend a week at his aunt’s house. 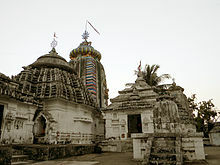 About two kilometres from the Jagannath temple is the Gundicha Mandir, which is supposed to be the temple of the aunt of Lord Jagannath. 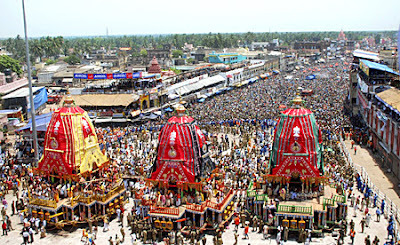 Since then, every year on the Ratha yatra day, all the tree deities are taken out in a grand procession in three different chariots to Gundicha Mandir. There the deities are taken inside the Gundicha Mandir where the triad rest for a week and return to the Jagannath temple in what is known as the ‘ulta-rath’ or the reverse-chariot. Some versions say that Subhadra wanted to meet her parents in Dwarka and the procession is to mark this occasion. Some other versions say that Kansa, Krrishna’s uncle had sent his messenger Akrur, to fetch Krishna to Mathura from Gokul. All of Krishna’s friends and his gopis blocked the way and Krishna had to pacify them that he would not be harmed. The ratha-yatra is also supposed to be in commemoration of this separation of Lord Krishna from Gokul and his childhood friends and gopis. Yet another local version says that the mortal remains of Lord Krishna was transformed in a wooden log which was found by a local Savara (an aborigine of the region) who started worshipping it. Later King Indrayumna took it from him and carved out three idols out of it and established a temple for the same. There are many other legends associated with the Lord and his chariot. But what is interesting is the origin of the cult of Jagannath and his worship. This we will discuss next. Dhritarashtra was the blind king of Hastinapur who was put on the throne after his younger brother, Pandu, had to go to the forest to atone for his sins and his subsequent death. He was also the father of the hundred Kauravas. Is the comparison valid? Let’s see. Dhritarashtra was blind and thus could not see; our PM is not blind (at least physically), but he still cannot see; else he would have done something about all the wrongs that are happening in his PM-dom. Dhritarashtra was blind to the aspirations of (his son) Duryodhan and despite knowing about the wrongs done by him, said nothing. Our PM was also well aware of the wrongdoings of some of his ministers (thankfully not his sons), take Raja for instance, but allowed him to continue, till the ant became an elephant, and it could not be hidden under the carpet. Dhritarashtra did not say anything when Draupadi was being disrobed in public in the court just as our PM is keeping mum when the country is being robbed off its pride and being abused by many known to him. Dhritarashtra did not have any friends who could guide him, but had many who would mislead him. PM too has no friends who can guide him, but is surrounded by allies who actually misguide him and have their way, as and when required. This lack of ‘good and true’ friends has been the bane of both Dhritarashtra and the PM. Dhritarashtra did have some voices of sanity which used to try to dissuade him from following the wrong path, like Vidura, PM has none. There is not a single guide in his cabinet whose sane voice he can follow. Dhritarashtra always aspired to be the King, in spite of his disability, i.e. his blindness, but our PM is a reluctant politician, who knew well about his disability, i.e. lack of knowledge of politics, but went on to take the position of leadership. Needless to say, that both have proven to be poor leaders. To conclude, let me tell you a small story which many might not know. At the end of the war of Kurukshetra and on the death of his hundred sons, Dhritarashtra asked Lord Krishna as to why was he destined for such a tragic life, of blindness and bereavement of hundred sons during his life time? Lord Krishna asked him to close his eyes and Dhritarashtra saw, that in his previous life, he was a tyrant king. Once he was passing by the sea and saw a swan surrounded by a hundred cygnets (baby swans). On a moment of sadistic pleasure, he ordered that the eyes of the swan be gorged out and all the cygnets be killed. This cruelty had led him to be blind in this birth and was made to bear the death of his hundred sons, just as he had done to the swan. Dhritarashtra realised that this was his karma and none were to be blamed for this. Dhritarashtra’s behaviour was due to his karma, but what is the cause of your behaviour Mr. PM? According to a legend from Mahabharata, during the thirteenth year of the exile of the Pandavas, Draupadi saw a ripe jambul, roseapple, hanging from a tree. She plucked it to have it. No sooner had she done this, Krishna came from somewhere and stopped her from eating it. According to Krishna, the ripe fruit was supposed to be the fruit with which a sage was supposed to break his twelve-year fast. Not finding the fruit at its place, could earn the wrath of the sage, resulting in more trouble for the Pandavas and her. Draupadi begged of Krishna to help her out of this impending problem. Krishna, then said that the fruit could be put back at its original place, only by someone who holds no secrets. Draupadi had only one option and to confess some guilt. Seeing no way out, Draupadi walked up her husband’s and confessed to them, that though she was a chaste woman and loved all the five husbands, there was someone else that she longed for. She always had loved and respected Karna, the arch-enemy of the Pandavas. This was a shock to all the husbands, but none said anything. Having confessed, she went and put the fruit back on the branch of the tree and all was well. A simple story, and not mentioned in many versions, but considered to be an important episode in many folk renditions of Mahabharata and sometimes better known as ‘Jambul-akhyan’, the jambul-episode. Many well known authors and re-tellers of Mahabharat have explored this angle of Draupadi. All popular versions have mentioned that Draupadi did not love all five husbands equally (not possible for anyone to be capable of equitable love), and that she loved and longed for Arjuna more amongst all the brothers. However, it is also true, that Arjuna had never reciprocated the emotion as he was more in love with Subhadra (Krishna’s sister) than anybody else. The hidden love of Draupadi for Karna is something that has been explored by many writers. Some have even justified the romance, in the sense that the powerful and the dynamic character of Draupadi could find her match only in Karna and not in the five brothers, who were ‘incomplete’ without one another. It is said that even Karna had regretted his behaviour during the disrobing of Draupadi in the Kuru court after she was wagered and lost in the dice-game, and the behaviour was more to avenge his insult during the swayamvar of Draupadi. The undercurrent of an unexpressed romance has always been suspected in the entire Mahabharat. This myth has dual purpose. One is that everyone has secrets which they keep to themselves. Some of them are not revealed out of fear of antagonising ones loved ones and the fear of losing them if the secret is out. Sometimes it is not revealed as it would upset the apple cart, so as to say. In this case, it did shock the five husbands, but they respected the honesty and the forthrightness of Draupadi and more so because of the cause of revealing the secret, i.e. to avoid earning the wrath of the fasting sage. The significance of a confession is well brought out and the fact that it only does well and seldom any harm. The second purpose is that through this myth, the Pandavas also get the message that in spite of five brave husbands, they had failed their wife when she needed them the most. When Draupadi was being disrobed after she was lost in the dice-game, none of the ‘brave’ husbands could come to her rescue. It brought out the weakness amongst each one of them, and that Draupadi had a soft corner for someone who was more a man than the five of them. This was an insult which they had to bear without any malice towards their wife. Also, being the wife of five, made her that much vulnerable to such acts, than it did to their own wives, which each had taken for himself. If Draupadi had married Karna would this have happened? The question could well be, would Mahabharata have happened? This is the season of Jambul’s. Go get one for yourself and eat it. If it stains your tongue, then it means you too are harbouring a secret!!! Show me a man who doesn’t like mangoes and I’ll show you someone with faulty taste buds! Mangoes – the ripe, luscious, fruits which have something in them, that makes a child out of a grown-up man or a woman (lest I be accused of being sexist!). Mangoes, ripe or raw are a culinary delight. This King of fruits is an all time King of good times (no pun intended!). 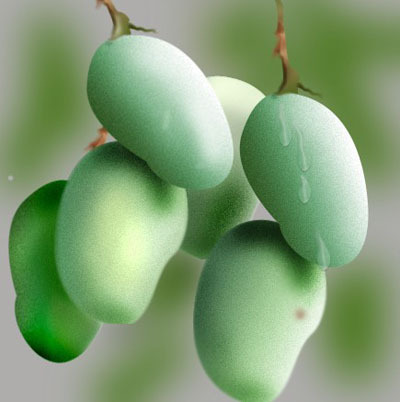 There are other fruits in the market, but none hold sway on man and its kind the way mangoes do. Have you ever heard crates of bananas being sent to a daughter’s in-laws house? Have you ever brought crate-full of apples and had them for breakfast, lunch and dinner and look forward to the same for the next day too? Have you ever seen any other fruit evoking such erotica the way a certain lady squirms on your TV screen with a ripe mango? So what is it about the fruit that makes one go all out for it. The answer lies in antiquity, like all quests lead you to! According to a Vedic myth, Surya bai, the daughter of the Sun god was transformed into a golden lotus to avoid being troubled by an evil sorceress. The sorceress was angry when she found out that the King of the land had fallen in love with the lotus, so she burnt the flower to ashes. Love triumphed as a beautiful mango tree grew from the ashes of the flower and Surya bai stepped out of a mango which was found on the ground. The King recognised his love and the two were united. Lord Buddha was given a whole mango grove for him to rest whenever he wanted to. Since then the mango tree was considered as a wish fulfilling tree. Mangoes are considered to be a symbol of love. The Mango leaves are considered auspicious especially in marriage rituals, which are used to assure the birth of sons. It is said that whenever there is a birth of a son, the mango tree bears new leaves. Lord Ganesh is seen carrying a ripe mango in one of his hands as a sign of attainment, the aspiration of every devotee of his. In Kalidasa’s Shankuntala, Kama, the god of love is supposed to have used the flowers of the mango tree to invoke love between Shakuntala and King Dushyant through one of his arrows. Goddess Ambika from the Jain mythology is traditionally shown as sitting under a mango tree. This takes us to one of the most important sites of Shaivite centres of devotion, the Ekambareswar Temple at Kancheepuram, Tamil Nadu. Translated literally, ‘Eka’ means one and ‘amaram’ means Mango tree, together, Ekambaram means One Mango Tree and Ekambareshwar means god of the one mango tree. The temple was built during the Pallava rule and completed by the Chola rulers. 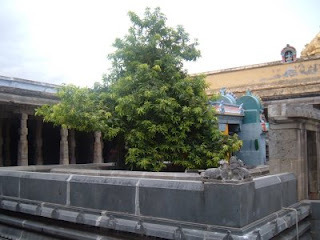 But there is mythology around the temple and one of the most important area of the premises, which has a mango tree! It is said that once goddess Parvati was doing penance under the mango tree in the temple premises. To test her devotion, Shiva sends fire at her. Parvati took the help of Lord Vishnu, who with the help of the rays of the moon managed to cool the tree as well as Parvati. Shiva then sent the river Ganga to disturb Parvati’s penance. Parvati convinced Ganga that they were sisters and that she should not disturb her penance, to which Ganga agreed. Parvati then made a shiva-linga out of the sand and got united with Shiva. Shiva here came to be known as the Ekambareshwar or the god of the Mango tree. 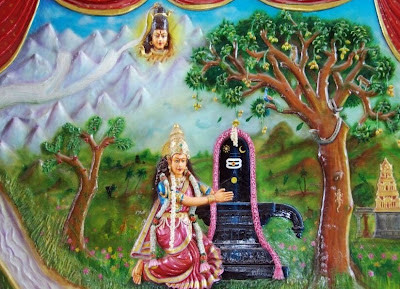 The tree in the premises is said to be the same tree under which Parvati performed her penance. The tree is sacred and unique in the fact that the four branches of the tree represent the four Vedas and it is said that the tree bears four different kinds of mangoes in four different seasons. (What is not mentioned however is that it is highly possible that someone in the days of yore had probably done some intelligent tree-grafting, which has survived till date – but then followers of faith do not see eye-to-eye with the doubting-Thomases of the modern world!). Mangoes have not been a topic of discussion just in mythology and religion. 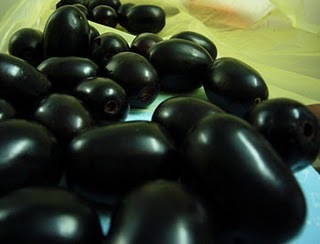 The uniqueness of the fruit is supposed to have first travelled outside India, during the travels of the Chinese traveller Hiuen Tsang who is considered to be amongst the first to take the tales of the fruit outside India. Later the Portuguese took the fruit out to other parts of the world. There are numerous Indian folk-tales which have the eating of the mango associated with miraculous child-birth and seduction. There are legends about the royal courtesan in the kingdom of the Vaishalis, who came to be known as Amrapali since she was found under a mango tree. (But then that is a story from history and we will not discuss that here at the moment). To conclude on a doubting note; according to many scholars, the story of Adam and Eve took birth in the tropical zones which are not conducive for the growth of apples and pears. What could be highly probable, keeping in mind the tropical weather, was that the fruit could be either the papaya or a mango; papaya being highly improbable as a fruit of seduction (! 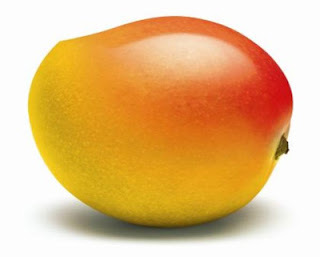 ), could it have been the mango, which hasn’t quite lost that charm even now?